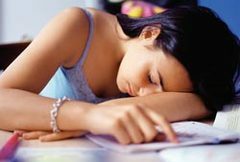 A survey of British teens revealed that nearly a third are not sleeping enough at night, dozing only for four to seven hours. The probably cause, according to the study, is their device-attached lifestyle. Many of the kids had either a computer, phone or music player in their bedrooms, and a good percentage often went to sleep with one of those devices still turned on. Agreed with the research survey, teens are all the time get stuck up either with their mobile phones or some electronic gadgets. They hardly find any time for rest and sleep.